Arch of aorta gives three major branches. 1st Innominate, a small common trunk which divides further into right subclavian and right CCA. 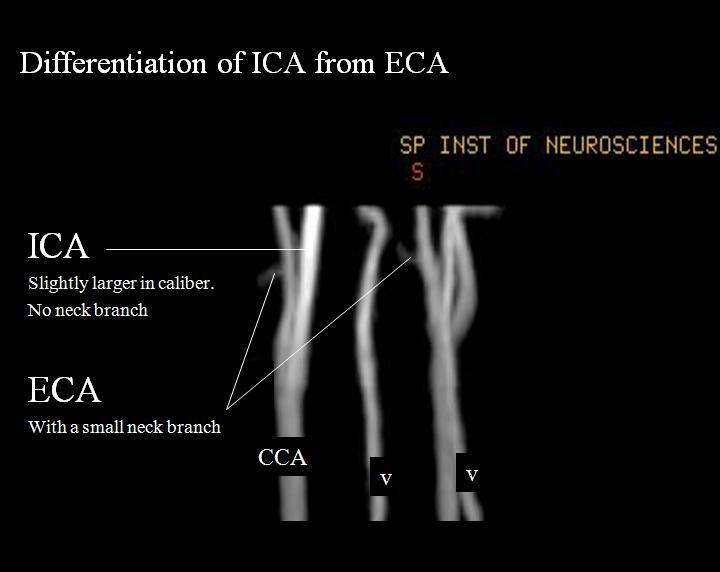 CCA on either side ascend upward and divides at the level of thyroid into ICA and ECA. 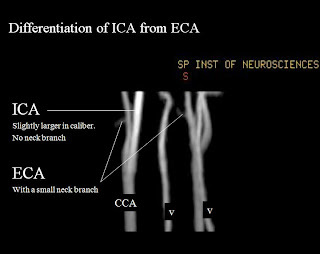 ICA ascends intra cranially and represents afferent of anterior circulation on either side. Subclavian on either side gives off vertebral which ascend upward intracranially and represent afferent of posterior circulation. Intra cranially on either side, ICA which represents anterior circulation divides into ACA and MCA. 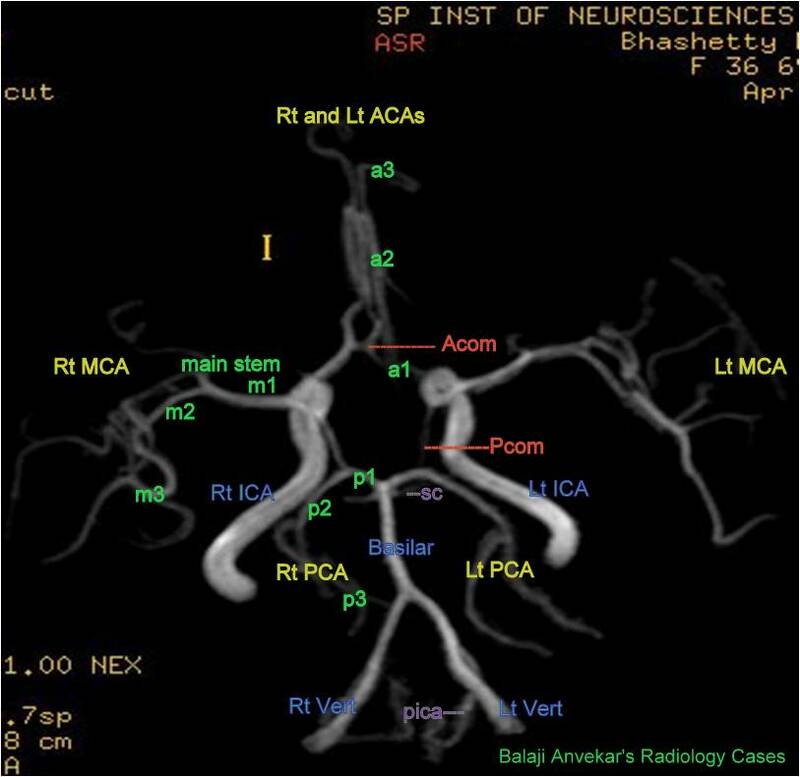 Vertebrals which represents posterior circulation join to form basilar in front of Pons, which divides further infront of mid brain into to PCAs for each side. 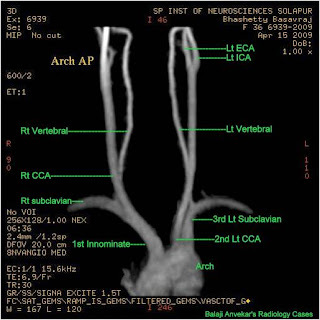 ACAs from each side extend antero medially and ascend along interhemispheric fissure. The anterior communicating artery (Acom) forms a bridge between the two ACAs and contribute in completion of circle of Willis anteriorly. ACAs on either side, its proximal most portion, proximal to Acom is pre communicating (a1) segment, distal portion is post communicating (a2) segment and divide further into cortical branches (a3). MCAs on either side, its proximal portion, the main stem (m1) extend laterally along Sylvain fissure and divides into superior and inferior divisions (m2) , ascent over cerebral convexity in perisylvian region and divide further into cortical branches (m3). PCA on either side extend posteriorly. The posterior communicating artery (Pcom) , a small branch from supra clinoid portion of ICA extend posteriorly between ICA and PCA and contribute in completion of circle of Willis by forming a bridge posteriorly laterally on either side. PCAs on either side, its proximal most portion, proximal to Pcom is pre communicating (p1) segment, distal portion is post communicating (p2) segment and divide further into cortical branches (p3). I want to reproduce one of the figure about MR angiogram of cicle of Willis in one of my article.